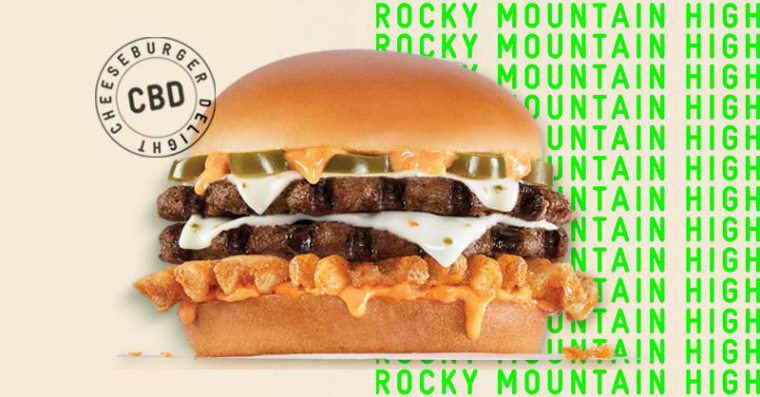 The 'Rocky Mountain High CheeseBurger Delight' will feature two beef patties, pickled jalapenos, pepper jack cheese, waffle fries — and about 5 milligrams of CBD. Carl's Jr. Rocky Mountain High: CheeseBurger DelightCarl's Jr. In the meantime, local health departments across the country have been cracking down on restaurants that sell on CBD-infused food and drinks. The choice to debut the burger in the Mile High City is no mistake. Colorado was one of the first states to legalize recreational marijuana. As a result, cannabis is one of the state’s fastest-growing industries. Last year, the state’s medical and retail dispensaries sold $1.55 billion of marijuana, according to Colorado’s marijuana sales report.